All of the films in one box set for less than what you think it would cost. As you can see, all of the films have special features (for some reason part 4 has the most), but not very many of them are worth the time. The features on the first film are good, with most of the cast turning up for a few minutes. There is some good background about the film given, but not much else. The commentary track is also good with the participants having a great time catching up and talking about the film. The featurettes on the remaining films are very dull and lifeless. If Warner Brothers had collected all of the featurettes and interviews into a full on documentary about the series that would have been great, but all of them separate and without focus they are just not that interesting. One thing that is nice is that all of the films have their respective trailers. All films should have at least a trailer on the disc. It allows fans to see how the films were advertised. I like revisiting old trailers and this set has us covered. Does this yell out wacky police hijinks to you? This is, by far, one of the laziest packagings I have ever seen. 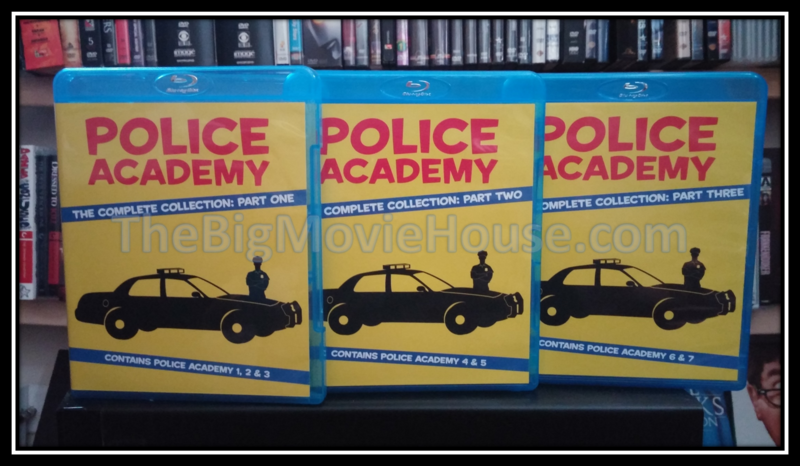 The only thing that would have been worse would have been putting the discs into those paper sleeves and then putting those sleeves into an envelope that has “Police Academy ” written on it with marker. There are three 14mm blu-ray cases inside of a slip box. The slip box is yellow and on the cover has a police car, a police officer, and police tape (which is blue for some reason), all in silhouette. 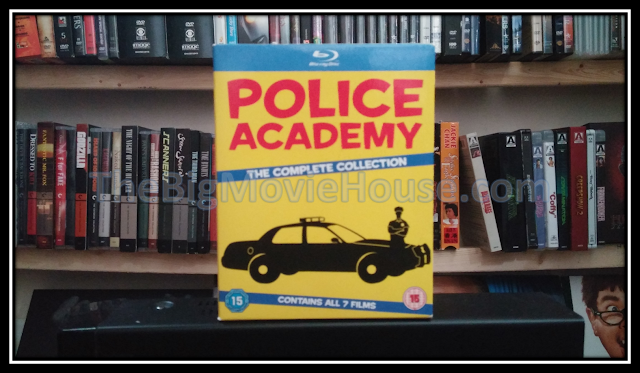 Usually, the art work will tell us something about the film(s) contained inside, but this art work tells us nothing about the films except that they are police officers, which is something that you can tell from the titles of the films. 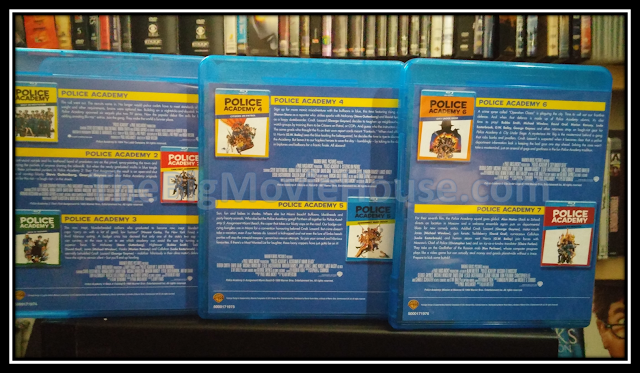 The blu-ray cases contained inside display the same crappy art work. On the back of the slipbox each film is given a brief description and information about the languages on each disc. The films are identified with the, now classic, theatrical posters. These, however, are so small that you can not make out what each one is. 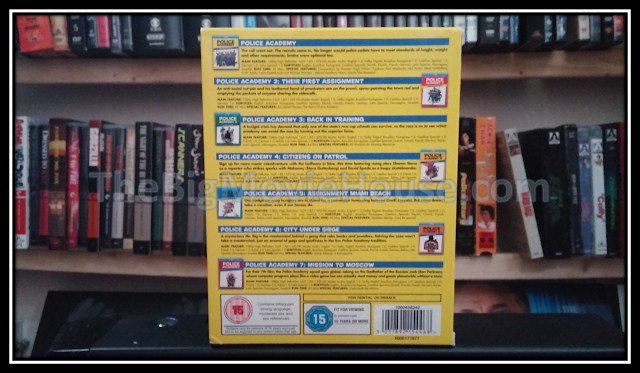 The back of the blu-ray cases themselves are the same way, but they include only the films that are in that case. The first case has the first three films, and the second and third cases have two films each. Each film gets its own disc, which is really nice, especially when compared to other sets that put at least two films on a disc. Warner Brothers could have done this but they chose the other way. 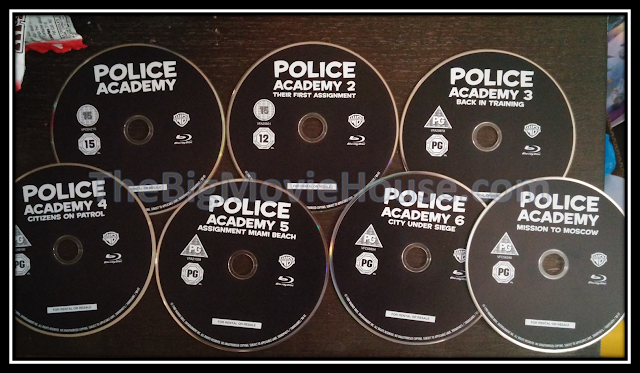 All of the discs are black and contain the name of the film in white. Black and white. Plain as day. Horrible. All of the blu-rays inside this collection are REGION FREE. Each film is given a dated transfer, but that is not necessarily a bad thing. Except for the third film (which I get to in a minute) looks really good. The first film looks the best as this was given a remaster. The rest of the films look good with colors looking really nice and a thin layer of grain is seen throughout each film. There are some scenes in each film where the grain jumps to a higher level, but this usually has to do with process shots or stock footage. Part 3, Back in Training, is, for some reason, given the DNR treatment. I have no idea why this was done to just this film, but grain is mostly gone (except in those process shots I talked about), giving the film a depressing look. Everyone in the film look like wax museum statues and the detail is a blurry mess. Every once in a while a detail will pop up, but that is gone by the next shot. All in all, Warner Brothers gave these films, except for part 3, a nice reception on blu-ray. Each film is given a DTS-HD Master Audio Mono track and the tracks do their job. Since they are in mono, there is nothing going to the side speakers. This is missed, especially when there are big crowd scenes or during action scenes. This is fine because that is how the films were made. Plus, these films don’t really need the surround. It would have been nice, but those tracks would have been fake and not true to the films. Dialogue is clear and there was never a time when I couldn’t hear something. 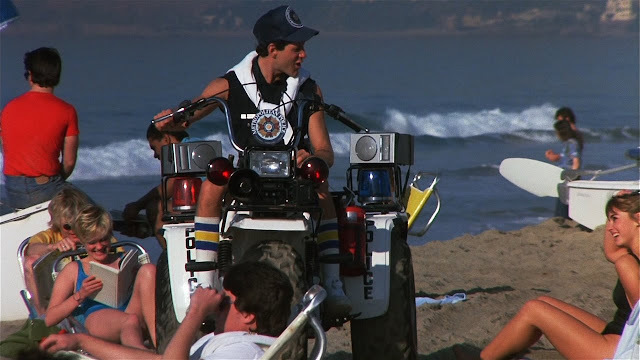 The Police Academy films were a mainstay for a lot of kids growing up in the 80s.Every year there would be a new Police Academy film and that meant that we got to go to the movies to it. I am sure that my parents hated sitting through these films, but I could never see why. These films were funny and thrilling. As an adult I can see why my parents cheered for joy when 1990 came around and there was no new film and then ’91, then ’92 and so on. These films are not high art. They are nothing more than slightly cruder Warner Brothers cartoons. In fact, as the series went on, the lighter and crazier the films became. 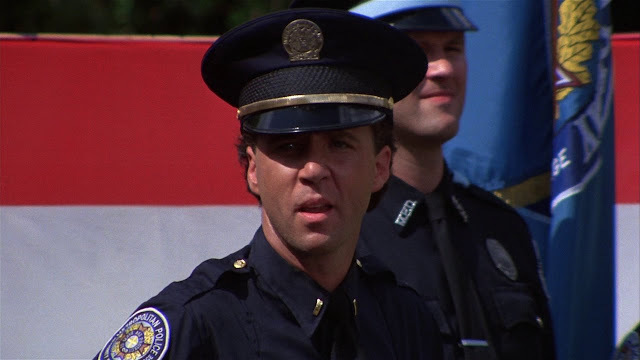 The final big theatrical film in the series, City Under Siege, is nothing more than a Looney Tunes cartoon brought to life. As much as I can see why my parents loathed these films, I can’t sit here and tell you that they are crap. 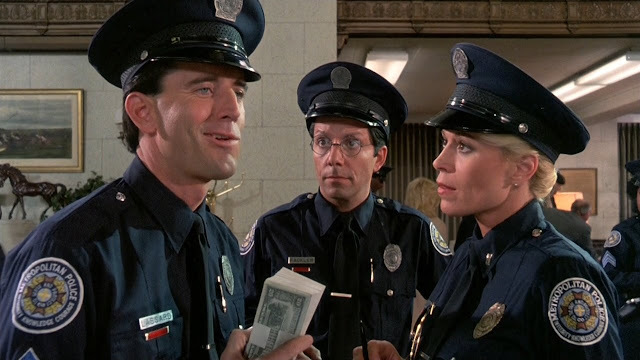 Sure, the first film has more jokes than punchlines and the schtick with Tackleberry grows old fast, but these are the type of films you watch on a rainy day, when there is nothing better to do than watch something to make the day go by quicker. I bought this series to help with my crippling anxiety and it helps. 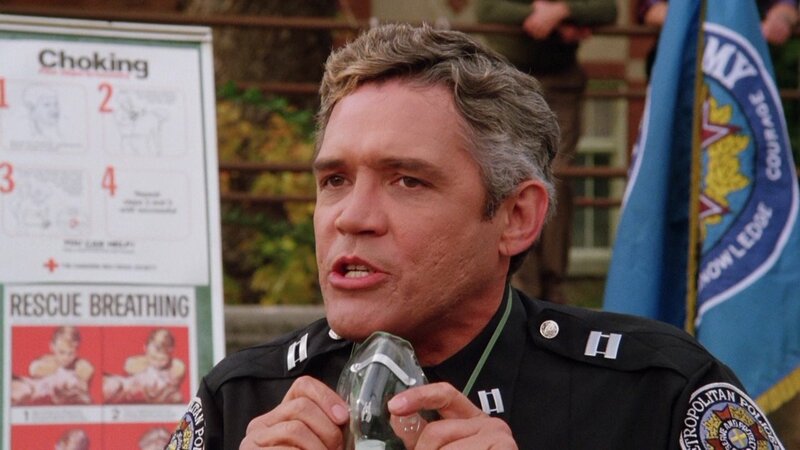 One thing that I noticed is that there is some really racist jokes in the earlier films. There is a blackface joke that I don’t think that was delivered very well, but it is there. There is also a scene, I think that it is the second film, where Jones, the guy who makes the noises, fights off a gang that is harassing an Asian market owner. I did get a laugh when Jones first sees what is happening and says “Hey, that guy is my greengrocer.” I did not laugh, however, when Jones throws each of the gang members into the truck with all of the vegetables and says, in a very thick Asian accent “Not on the brocori.” The scene was amusing and then they had to throw that in? Outside of the instances of racist, the films are at least amusing. That is except for the last one. The series was going strong, but every sequel would make less money than the previous one. When the sixth one, City Under Siege, made a flopped, Warner Brothers wanted to sit on the series for a bit. 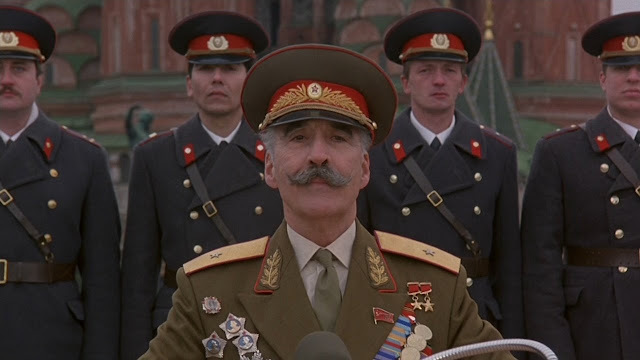 In 1994, they thought that the world needed a new film and Police Academy: Mission to Moscow was released to poor box office and terrible reviews. You can get through the rest of the series just fine, even if you hate the film, but Mission to Moscow is just awful. Not one joke works and the returning actors don’t look like they are having too much fun. It is a sad end to a series that 80s kids grew up on. 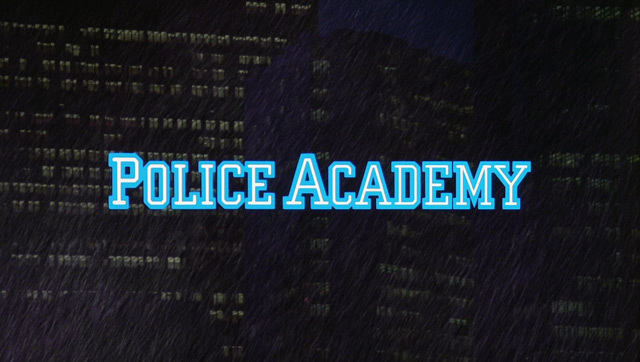 The Police Academy series is a fun series of films. They don’t try to reinvent anything; they just try to make you laugh. The films don’t succeed all the time, but the times a joke lands is a good time. Give the films another try. Except for the lackluster special features for the sequels, the DNR’d third film, and the horrible last film, this is a nice collection. I wish that Warner Brothers had given more thought to the packaging, but that can be overlooked because of the film. I love great packaging as much as the next collector, but sometimes you just have to look past the packaging. Anyone who wants good rainy day material or likes these films should pick this set up. It is usually between $15 and $30 depending on who you buy it from, but it is worth it, crappy packaging and all.